and Makes Sauna Planning and Sauna Building so Easy! ... Order it Now! NOW FREE !! The original edition of this best-seller sauna book is available ... FREE! This book has helped 65,000 saunas get built since 1974. Written by the Sauna-Guru, Pertti Olavi Jalasjaa. Over 65,000 Saunas Have Been Built the Easy Way - With This Building Guide! Use It When You Order Your Sauna Products! This coupon is valid for a credit toward the purchase of your sauna products at Home Saunas Since 1974. Order the sauna building book today and be registered for a discount coupon worth $150, $85, $50 or $40 on a purchase of sauna kits, sauna heaters, etc. You will be automatically registered for a discount coupon of $40 to $150. The book will be FREE in the end - plus you get a product discount when you purchase. Customers buying a sauna kit are eligible for the coupon discount as above! This coupon can be applied to a minimum $200 purchase of sauna products. Discounts are applicable 6 weeks after purchasing the sauna book. Your $40 to $150 OFF discount is automatic! Click to Order Your Sauna Book Now!! ... ... ... ...$150 Off ?- The Next Sauna Book Customer - You? Planning and building a perfect home sauna is much easier when you have "The Art of Sauna Building". With our sauna plans and helpful guides, any do-it-yourself'er or even a novice can easily build a beautiful home sauna, with everything done right the first time! The "Art of Sauna Building" has become the industry bible for correct sauna design and sauna building techniques. 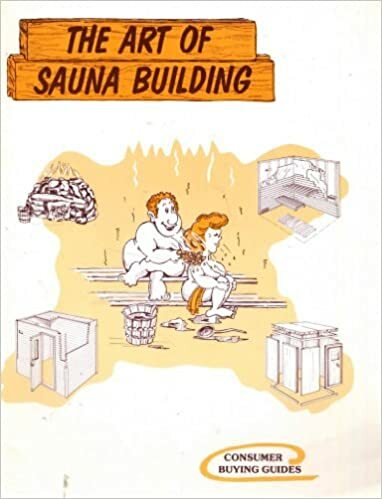 You should not build a sauna without this book as your own sauna building guide. The book is FREE - to help your project get started! In this book, author and Sauna Guru Pertti Jalasjaa (a master sauna builder), reveals all the secrets so you can build a professional-looking sauna the first time! It's an easy-to-read book with 164 sauna drawings and illustrations so you can build your own sauna correctly! Use the material lists, drawings and blueprints to save hours of time on the project! There are guides in "The Art of Sauna Building" to help you select the right supplier for the sauna products you want. Coming soon: A Sauna Buyers Guide. Over 65,000 saunas have been built using this industry bible. Dry Sauna, Wet Sauna, Steam Sauna and Traditional Sauna - How to Have the Best of All Four! After construction is done, the section on "Getting the Maximum Enjoyment" will make you wonder why you waited so long to build your own home sauna! To Order - Click to Order Your Sauna Book Now! "I got your book some time ago and I am using it avidly to help with my sauna build. Best book I could find is now paying off. My outdoor sauna will be finished next week! Thanks for your advice. I'm glad I made this book a must read!" "Your book, "The Art of Sauna Building" is by far the best book on sauna construction that I've ever seen". "Sauna-Guru, So glad you were able to talk to me. You took the time to listen to my issue ... dumb as it was. "I amazed my friends and myself too! My cedar sauna looked great when I was done and in less than 24 hours!" "I'm not very handy at all but it was very easy to build with the sauna book. Saved me a lot of time and about $1100 compared to others"
"Your sauna package kit & your book were fabulous! I will recommend you anytime!" "I love the chapters on the customs and traditions of Finnish saunas! I am a total sauna convert!" 1. *** CLICK HERE to email us your order information using our email form on this site. 2. or *** ORDER NOW? - Call us at 1-800-519-5753 ... with your credit card authorization before 9 p.m. EST today! Or call us the next day after you email us your shipping info. Due to the heavy order load, we cannot call you for your credit card info. 3. To be eligible for the $150 discount coupon, a book must be mailed out 45 days in advance of a sauna product shipment. Your credit is automatically registered on the day you order. 4. *** CLICK HERE to email us your order information using our email form on this site. Throughout our website, we make generous use of the material from our best-seller sauna building book, "The Art of Sauna Building". Over 40,000 copies of our book have been sold to date. We have helped over 65,000 saunas get fired up - representing over 120,000 people finding happiness in having their own home sauna. So, perhaps you are next? The sauna book contains considerably more information than this website shows. Let the 164 pictures in the book tell the story. Order today! Books are mailed out every 2 - 3 days. Allow 7 to 10 days for postal service. Occasional emails that are informational about saunas may be emailed on occasion. You can "unsubscribe" anytime.